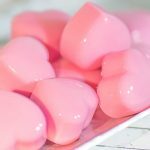 These little pink heart-shaped bites are Raspberry Fat Bombs. Their flavor floods your mouth as you bite into them with a creamy taste accompanied by a hint of raspberry. Simply delicious! Add the cream slowly whilst stirring and continue to stir for 1 minute. If you add the cold cream in all at once and don't thoroughly mix, the jellies will split creating a layered affect.